A family portrait of Donald Trump, his wife Melania, and son Barron appeared in August 2016, but some viewers were skeptical of its authenticity. A photograph shows a real portrait of Donald Trump and his family. 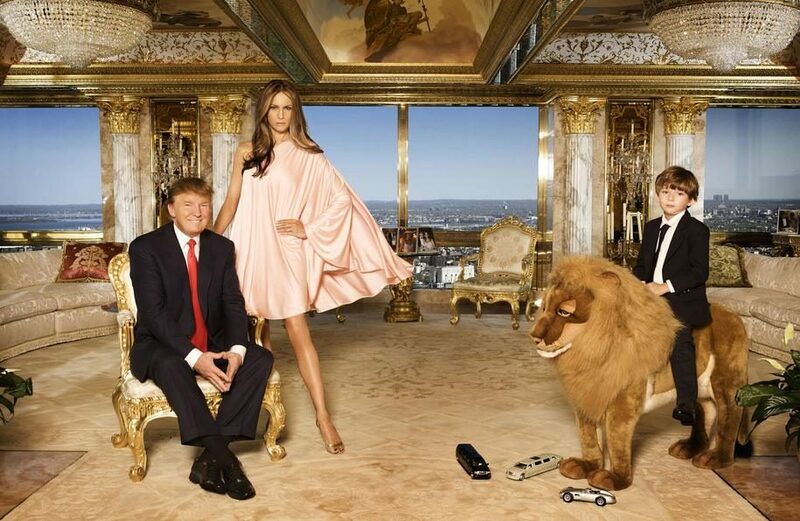 A friend and I are arguing about the origin of the photo of Donald Trump, Ivanka, and Barron with Barron sitting on the stuffed lion. She swears it's a photo-shopped, fake photo. Do you have any idea who took it or published it first? Donald Trump, Melania Trump and their son Barron Trump pose for a portrait on April 14, 2010 in New York City. Donald Trump is wearing a suit and tie by Brioni, Melania Trump is wearing a dress by Halston, shoes by Manolo Blahnik, makeup by Mykel Renner for Kett Cosmetics and hair by Mordechia for yarokhair.com., Barron Trump is wearing a jacket and pants by Papo d’Anjo, shirt by Leon and shoes by Todds. Mahaux has since had the opportunity to immortalize the Trumps repeatedly and did a series of family portraits in the beginning of the presidential campaign.